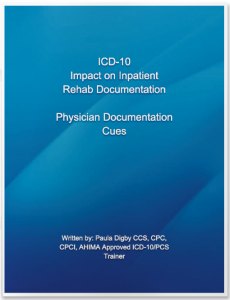 In this book, Paula Digby provides specific prompts for clinical documentation in the IRF setting. She also explains the rationale behind each of these prompts. Ms Digby offers examples of excellent documentation and of less than excellent documentation from actual cases. A separate section follows with just the cues.